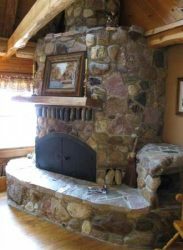 A rustic stone fireplace is often an important feature that is included in a new log home or timber frame home. 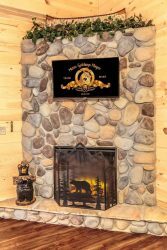 So, if you are thinking about including a rustic stone fireplace in your house plans, you need to consider what kind of fireplace would work best in your new home. 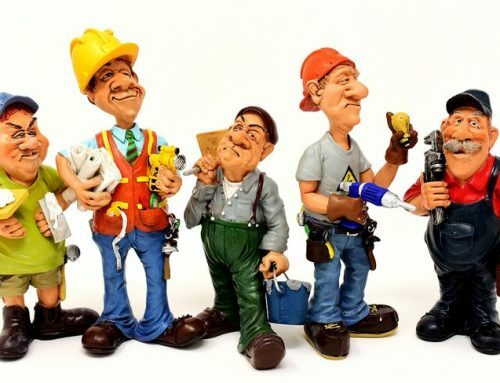 As you look at each rustic stone fireplace picture, consider which rooms in your home will need fireplaces, what kind of fireplace you need, and observe how each fireplace has been decorated. 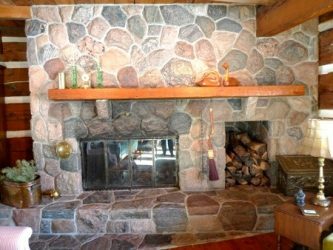 This rustic stone fireplace is interesting because of its curved corners. It also has a raised hearth and cast iron doors that close, keeping drafts out of the room when you are not using the fireplace. Also notice the lovely shades of color in the stones. This attractive rustic stone fireplace has cobblestones that look like they may have come from a river bed. Notice the slate hearth and the half log mantel. The mantel mirrors the logs used in the home. 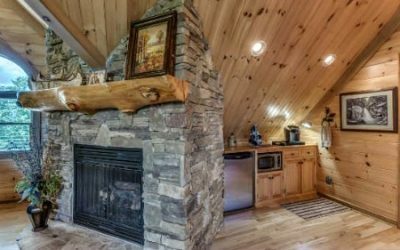 This pretty rustic stone fireplace goes from floor to ceiling and backs onto the loft space. 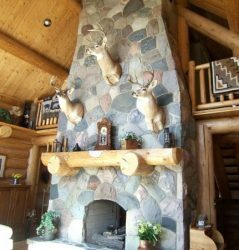 Deer heads and a rustic log mantel give the fireplace a hunting lodge feel. Note the pretty tapestries hung on the loft railing, giving the loft even more privacy. The loft could easily be used as an overflow sleeping area. 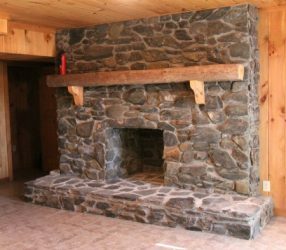 This rustic stone fireplace is massive, covering a large part of the wall. It has a built-in wood holder, keeping the mess of wood chips and dirt out of the room. Making your fireplace do double duty makes sense in a lot of homes. The hearth is raised, and glass doors provide protection from drafts. 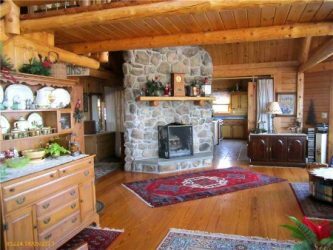 Notice the large rustic fireplace mantel that extends completely across the fireplace. Another fireplace that does more than one thing. Note the wood stacking cubby holes on either side of the firebox. Everything here is neat and tidy, yet it retains a country elegance. Pretty collectible plates don the rustic wood mantel. This beautiful free standing fireplace is a dominant feature in more than one room. It demands your attention, so it’s best to arrange seating in front of it. Note its simplicity and random shaped stones in pretty natural hues. A brass trimmed glass door dresses up the firebox area. This stone fireplace is quite the attention getter. Its unusual shape catches your eye, but it also serves as a room divider, visually partitioning off the little kitchenette to the right. 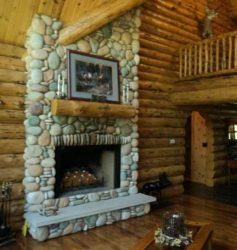 The massive half log mantel is a nice touch, as are the attractive decorative pieces on the mantel and the flowers on the hearth. 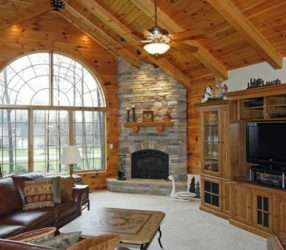 Here’s another example of how to use a rustic stone fireplace as a room divider, instead of just putting it on a wall. In this case, it separates the kitchen in the background, with the dining area. You could have dual fireplace openings in the fireplace, to take advantage of it on both sides. 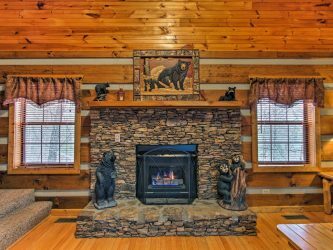 A pretty fireplace that fits neatly into this log home. 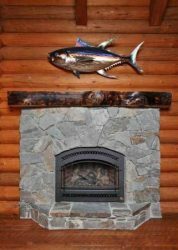 This rustic stone fireplace, against a log wall, just screams of a fishing lodge. It’s every fisherman’s dream to mount and hang the catch of a lifetime. 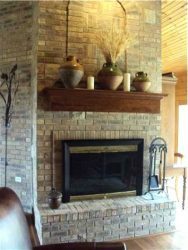 This simple fireplace that has a fireplace insert is practical and fairly inexpensive. 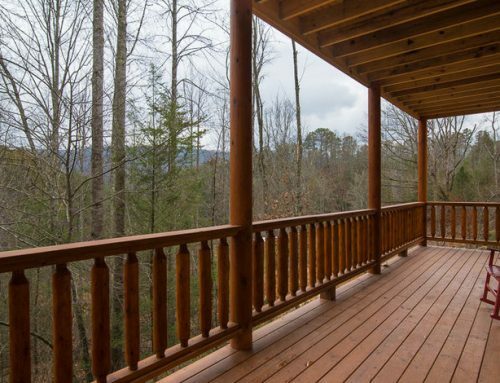 It would be a good choice for a seasonal fishing or lakeside cottage or cabin. You can’t miss this eye-catching floor to ceiling rustic stone fireplace! And it’s topped by appropriate rustic decor on the mantel. One thing to keep in mind when considering a tall fireplace is its weight. This one would work well, if it was constructed of cultured stone, which is lighter in weight than real stone. This massive rustic stone fireplace has a firebox like those built more than 100 years ago. 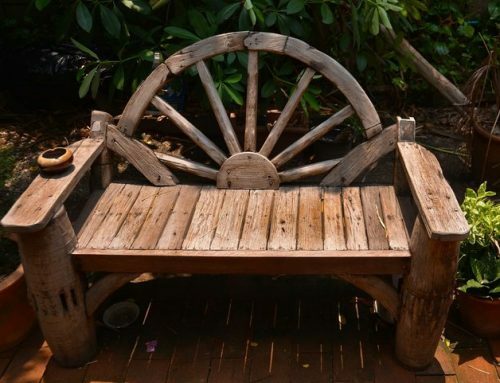 It has a colonial look, including its rustic mantel and brackets. Built on the ground floor, it would not require the extensive support system it would need it it were on the first floor. 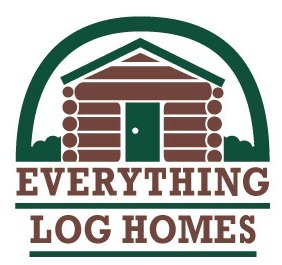 Limestone, with its shades of gray, can bring out the warm wood tones in a log or timber home. This fireplace, built in the middle of the room, has fireplace openings on two sides. The dark wood mantel contrasts nicely with the light gray of the fireplace. 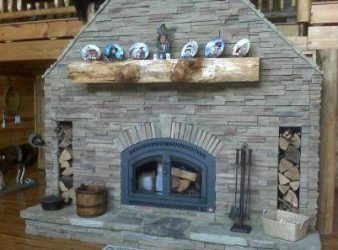 A rustic stone fireplace in a log or timber frame home is often placed between windows or French doors, facing the lake, mountain or river view. This is usually in the main common area, and a sitting area is placed in front of the fireplace. This fireplace has red tones in the stones that reflect the color of the wood in the home. Note the use of ceiling fans, another feature that you often see in homes with cathedral ceilings. This fireplace is built to be almost flush with the walls, not extending far into the room. This fireplace has incorporated colorful stones that contrast with the neutral tones of the wood in the walls. Note the irregular shapes of the stone and the use of black mortar, to make the fireplace even bolder in appearance. 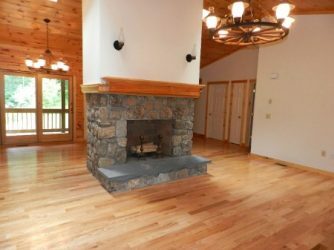 This fireplace is used in a seasonal home by a lake and doesn’t require heavy protection from drafts during the winter months. Last, but not least, don’t forget to consider adding a pretty rustic stone fireplace to one or more of your bedrooms. What a romantic addition! 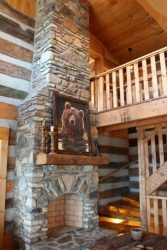 This fireplace contrasts nicely with the log walls and adds oodles of ambience to the master. Don’t forget to include a pretty quilt or comforter and some coordinating curtains at the windows. Using reclaimed barn wood for the mantel is a green solution and adds interest to your fireplace. Cultured stone, or fake stone, is lighter than real stone. 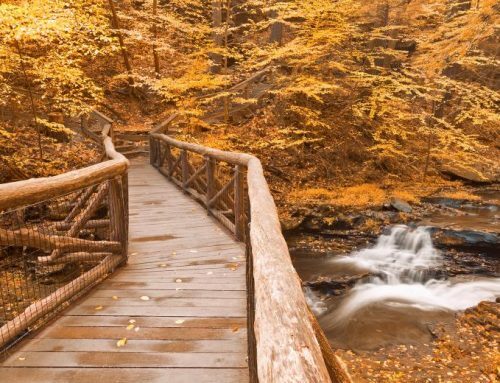 Some of it is very realistic and beautiful. When you use cultured stone, you may not have to reinforce the structure of your home–costly and more time consuming. Consider the colors of your walls and floors, and whether you want to have a contrasting rustic stone fireplace. Also consider textures and lines. 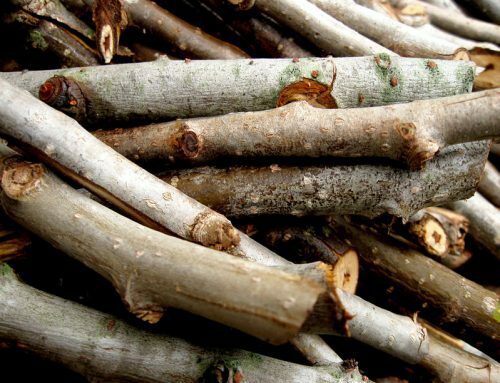 For example, if you have horizontal logs on all the walls, you might contrast the lines of the logs with cobble stones, which are more rounded. Inside or outside? Where do you want your fireplace to be? It can be built inside your room along an outside wall (sticking into the room), flush with the wall inside, with the fireplace actually outside the house. Or you can have it in the middle of a room or use it as a room divider to define spaces within your home.